Well, we had a fun weekend last weekend! My moms group went up to Apple Hill. What? You've never heard of it!! Whatever! It's a great destination just outside the Sacramento area, in the Sierra Nevada foothills. We went to Boa Vista Orchard and hung out by the pumpkin patch, drank apple cider, and ate cider donuts. The babies loved it. 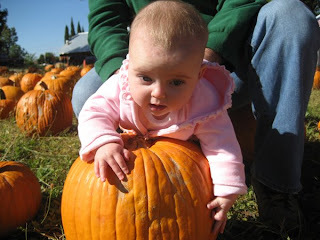 You'll see a picture of our little Darcy checking out the pumkins below! 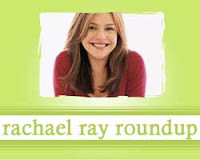 Kristen Doyle of Paper Palate made Rachael's Penne with Pumpkin Cream Sauce from Every Day with Rachael Ray. Ken of Dinner (and Drinks) by Ken was inspired by Rachael Ray's recipe to make a Quick Beef Stew. Patsy Kreitman at Edible TV compared chicken strip recipes from Rachael Ray and Robin Miller. Kayla Hutzler of Manhattan College informs us that Rachael will be making an appearance at "the 7th annual My Dog Loves Central Park Country Fair on October 18th, in the middle of central park (use the 72nd street entrances.) Even if you don't have a dog you are invited to enjoy food, games, and entertainment in one of the most famous parks in the country." Janine of Cheap Cookin' Mama adapted Rachael's recipe for Chorizo Stuffed Bread Bites.